Yoga is an ancient Indian system of physical fitness and holistic health. It is difficult to classify or categorize it as it encourages both physical and mental health and it is also an excellent relaxation technique. Also, many of the poses are geared towards stimulating the functionality and health of the organs. If you have been wondering just how many yoga poses are there in total, then let us tell you there are plenty. Here is a list of most common yoga poses with their Sanskrit names and benefits. 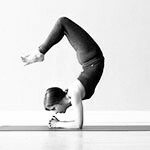 Bridge Pose (Setu Bandhasana) - Level: Intermediate; Strengthens neck and shoulders; Massages abdominal organs and kidneys; Tones lower back and calves. Big Toe Pose (Padangusthasana) - Level: Intermediate; Ideal for women who are trying to get pregnant; Improves digestion; Relieves a headache. Camel Pose (Ustrasana) - Level: Intermediate; Strengthens knees and back; Enhances balance and flexibility; Improves concentration. Half Bow Pose (Ardha Dhanurasana) - Level: Intermediate; Improves balance and limb strength; Increases joint health; Deep stretches abdomen and thighs.